It was a rainy evening in Thiruvananthapuram, Kerala. The mosquitoes were feasting on David Schnabel, an eight-time world champion in artistic cycling from Germany. Schnabel sat still and looked intently at them, almost as though he was savouring the bites. He was in Kerala at the invite of Goethe-Zentrum, to inspire youngsters to take up artistic cycling, a sport in which one performs gymnastics on the bicycle. He indeed had a tough task at hand as not many had heard about it. “Artistic cycling is not a very popular sport,” he says. “No wonder people here had not heard about it. I showed them all the possibilities there are with a bicycle.” He did a wonderful job of impressing the audience with his performance. From hand, saddle and head stands to squats and jumps, there was not much Schnabel did not do. Hundreds had gathered to see him perform on the street, despite the heavy rain. 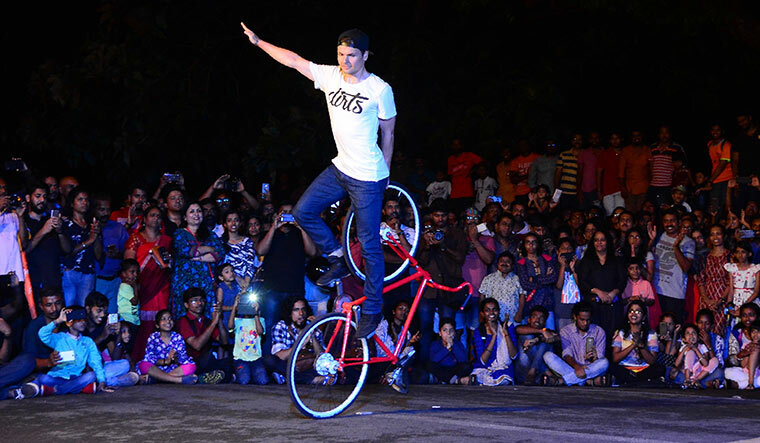 How did his tryst with artistic cycling, a sport that originated in Germany in 1890, begin? “It was my father who introduced me to it,” he says. “It was love at first sight for me.” Schnabel says he loves the combination of music and athletics in artistic cycling, which makes it both an art form and a sport. He hails from a family whose every other member is musically inclined. “All good sports are art,” he says. Schnabel has represented Germany nine times in the world championships, and has won eight golds and one silver so far. The cycles that are used for artistic cycling, mostly performed indoors, have no gears or brakes. And their handle bars are more flexible. He concludes by reiterating that he will certainly take some part of India with him when he goes back. “I must also share something for all the love and appreciation you people shower on me,” he says. A unique way of payback, one might say.